Not sure how this depicts The Sun? Click here. Etteilla: Enlightenment, Glory, Heaven, Fire. Lévi: This Hieroglyph depicts a radiant sun, and two naked children taking hands in a fortified enclosure. 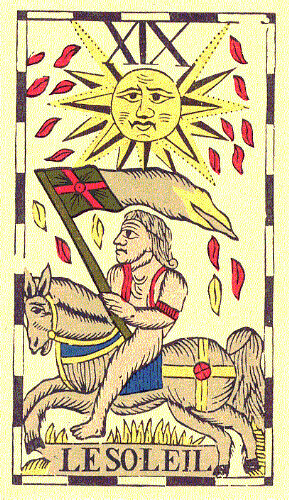 Other Tarots substitute a spinner unwinding destinies, and others, again, a naked child mounted on a white horse and displaying a scarlet standard. 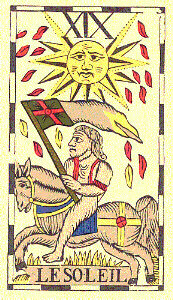 Illustration (right): The Sun from Le Tarot Flamand by F. I. Vandenborre (c. 1780) (re-published by Carta Mundi). Click the image for a larger one. Papus: The material world commences its ascension towards God. Christian: The Light of the Mysteries illuminates those who know how to use it; it strikes down those who are ignorant of its power or who abuse it. Felkin: The too-aspiring Icarus may find his wax wings of Ambition and Curiosity shrivelled and melted by the fiery rays of the Sun and the heat of Fire. Waite: The Sun signifies the transit from the manifest light of this world, represented by the sun of earth, to the light of the world to come. Wirth: The Sun reveals the reality of things and shows them as they really are without the veil of any illusion. The fog clears and the ghosts vanish in its presence. It is in this sense that the incarnated soul finds in the Sun its promised Redeemer. Case: It represents a degree of adeptship, that of liberation from the limitations of physical matter and circumstances. the clouds and shadows no matter for thee. twin forms of thy play. Gray: Attainment and material happiness. Good marriage and happy reunions. Achievement in art, science and agriculture. Studies completed, liberation; pleasure in the simple life. Sadhu: The light of the Higher Influxes enlightens human beings who become sincere and good like children. ONeill: The Sun card suggests rebirth as an innocent child. The Sun itself is a natural mandala and the children are playing about a mandala formed by fairy ring on the grass. The children could be Adam and Eve before they ate the fruit. The garden would also have suggested the Heaveny Garden of Paradise, the Rose Garden of the Philosopher, the reward of the just. Pollack: Under the Sun everything becomes simple, joyous and physical. The sunstruck person sees everything, each person, each animal, all the plants and rocks, even the very air, alive and holy, united through the light that fills all existence. Illustration (left): The Sun from The Aquarian Tarot by David Palladini (copyright &COPY; 1970 U.S. Games Systems). 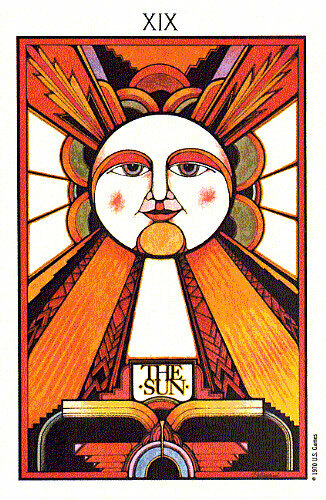 Turk: It is important to balance the card of the Sun with the card of the Moon. Symbol (top): It depicts simply a radiant sun. Copyright &COPY; 2000 James W. Revak. All rights reserved. Version 1.0 (8/9/00).